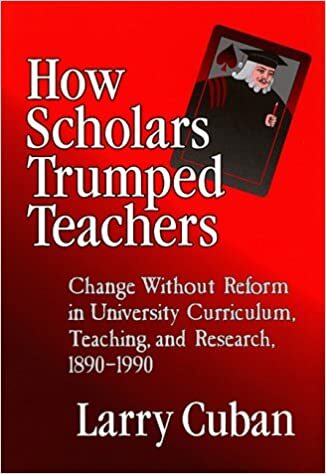 Browsing the shelves of the UNSW Canberra Library, I came across "How scholars trumped teachers: change without reform in university curriculum, teaching, and research, 1890-1990" by Larry Cuban (1999). This book is a case study comparing the history and medical facilities of Standford University. The author argues that the modern US university evolved from a combination of German research university and English teaching colleges. The result of this merging is tension between between the role of teaching and research, which has been unresolved for more than a hundred years. The author argues that the many attempts to change have failed. Unfortunately the Cuban does not offer an explanation as to why the combined teaching/research model of the US university (and university in Australia) has been so successful. I suggest it is simply that a research reputation is a good way to market courses. A student may well get a better education from a college which has staff trained to teach, but the resulting qualification will not be as prestigious as one from a research institution. As Cuban points out, university academics tend to be promoted based on research results, not teaching expertise, despite attempts to reform this. Unfortunately, what is detailed as having been attempted and failed at Standford decades ago sound very much like some of the reforms proposed to promote education at Australian universities today. Those reforms appear to be doomed to failure, just as those at Standford were. The problem, as Cuban details, is inconsistency between universities saying they value quality teaching, and rewarding staff with promotions for it. One way to resolve this would be to by using specialist staff for each function. This would be, I suggest, similar to a car company which has a motor racing team to bring prestige to the brand. The racing drivers, mechanics and engineers are not expected to be involved in the design or manufacture of mass produced passenger cars, but just help promote them trough success on the racetrack. Even if they wanted to build passenger cars, a racing car team would not be qualified to do so, as the demands of racing and ordinary day driving are very different. Similarly, even if researchers wanted to teach, their research skills do not equip them to teach. The researchers can bring prestige to the university, and thus promote enrollments in courses, but not teach the courses.